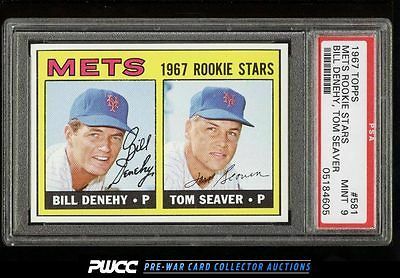 Shockingly high grade and overall immaculate Seaver RC which presses the limits of the PSA 9 designation. Boasts four extremely well conditioned corners which many would consider better than MINT, pack fresh surfaces, and exeptional print throughout. All told, this is a world class example, worthy of serious consideration. One of nearly 17,000 cards, lots, and sets up for bid in our 8th Auction of 2016. Click on the link above to view the other PWCC auction lots.